The podcast being recapped here was recorded with new mics. 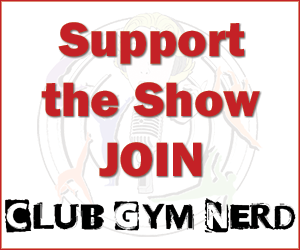 Big thank you to Club Gym Nerd members for helping us buy them! Now, take a look at the most important moments from night one. Gabrielle hasn’t made a coaching change. Christian Gallardo has been Gabrielle’s coach since she arrived at Buckeye. Since there is only to be one coach alongside Gabrielle throughout the Olympic process, Christian is that coach based on their longtime coach/athlete bond, chemistry and strength together. Some questions were raised: Can’t you have more than one coach on the floor (like Skinner and Kocian)? And, if Gabby needs a spot at Trials, is she really ready to be doing that skill? 2. Night one was a competition for alternate spots. Because with a conspicuously pre-selected team, a sub-par performance at one meet doesn’t really make a difference in the standings. E.g. Carly. And Carly. Ragan Smith: The crowd loved her floor. But couldn’t nail down proper clapping practices. Amelia Hundley: She never gave up, made it this far, and killed it. Kudos to you, Meals! Maggie Nichols: Used the code to her advantage, but do repetitive routines like some of hers deserve a composition deduction? Rachel Gowey: Angry beam. Safer dismount. A joy to watch, all around. Emily Schild: Thank you for this video. We’ll see you next as a Gymdog. Gabby Douglas: No one is scared for Gabby’s spot. World Champ turned judge, Jana Bieger: She rose the line flag with dignity, never abusing her power. Christina Desiderio: Along with her coaches, she provided a great example of realistic expectations. She probably wasn’t expecting to make the team, she performed her best, and was seemingly happy with the results. Aly Raisman: Huge improvements on bars. Cool, calm, trademark Aly everywhere else. Laurie Hernandez: Maybe overscored, but for her, its all about the performance. And that dangerously infectious smile. MyKayla Skinner: Really lived in the moment, let the bad memories go, and had a great night as a result. Brenna Dowell: She is in her element in elite competition. Stick around, Brenna. Tokyo might be for you. Madison Kocian: She’s going to Rio. Ashton Locklear: An alternate spot is hers. Hopefully, lots of UB World Cup medals will be too. Simone Biles: Even Simone felt the pressure. But not enough to make a difference. 4. Overall, this year’s team seems more pre-determined than years past. 5. The judging tonight was largely inaccurate, and the meet came off more like the Olympic Gala than the Olympic Trials. 6. We’re ready for the ugly cry, Aly. What kind of fluff will we be gifted of the Karolyis in retirement? Martha only has one pair of Team USA warmups in her hands. Who will be America’s Next Top National Team Coordinator? Why don’t more people wear crowns at weddings like Donna Strauss? What was your biggest takeaway from night one of Trials?